(L)et our young adults themselves tell you their impressions. 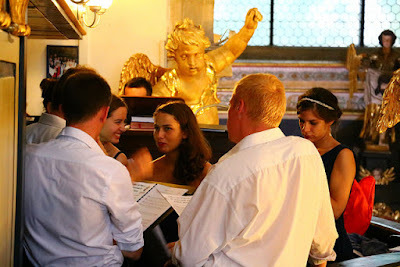 As a sample, we now quote Issac, who leads a polyphonic choir for the Traditional Latin Mass in Malaysia; Ríona, a Remote Sensing Surveyor in England; Simon is a student from the north of Sweden, where the nearest Catholic Mass is several hours away; Mathieu is a choirmaster from France: he attended the Masses and catecheses in the second church, with the French-speaking Juventutem groups; Aldo is from South Italy; and Dan is a photographer in England. 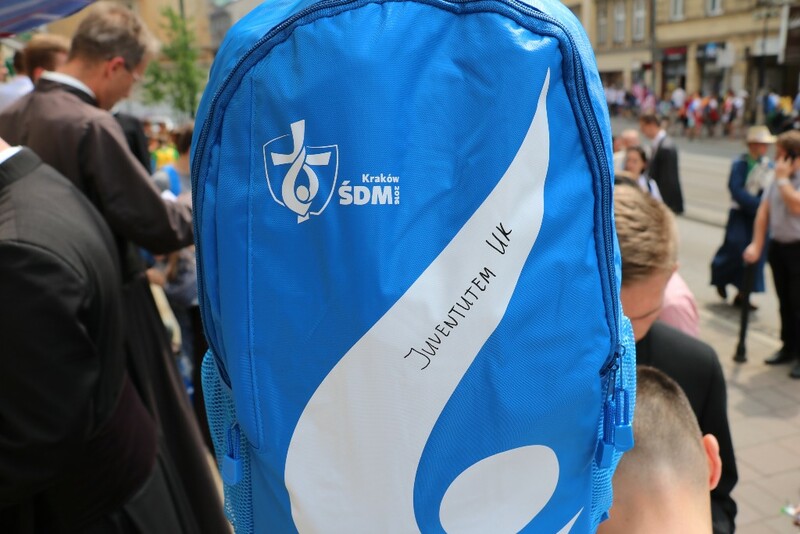 How did the Extraordinary Form liturgy with Juventutem add to your WYD experience? 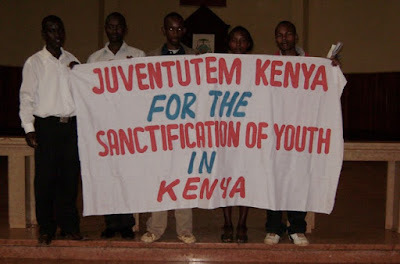 Issac: Juventutem is what attracted me. 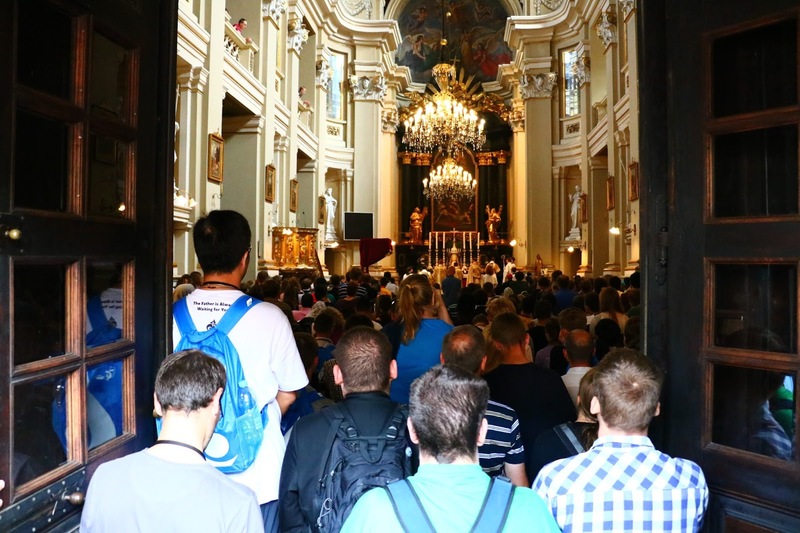 Simon: The Extraordinary Form liturgy with surrounding spirituality and mindset, did not add anything to my WYD, it was instead the very reason I decided to go on this trip. I was not left disappointed on this behalf, since all celebrations were utterly beautiful. The setting was well made, with a fine church and skilled musicians. Mathieu: I will rather speak in reference to my « Sequentiae Choir » with which I came. Several singers were not Catholic at all, and in any case not practising. They discovered the Extraordinary Form during that week. They all head back after the week asking themselves deep questions about the faith and the Extraordinary Form. “Beauty”, which they had not encountered in this context, was decisive. 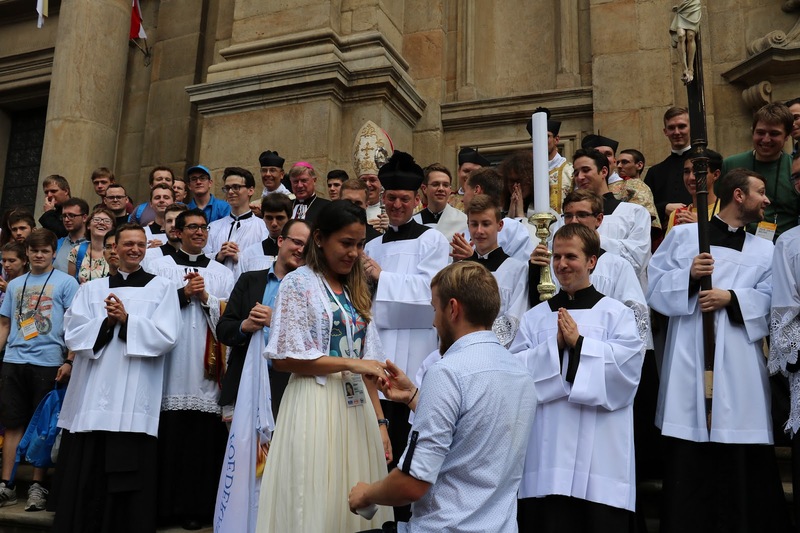 Janice, a young woman from Malaysia: Coming from Malaysia where the TLM is not available daily in the diocese, I can’t tell you how much it meant for me (and some of us) to have daily Mass in the traditional form every day for almost 2 weeks. 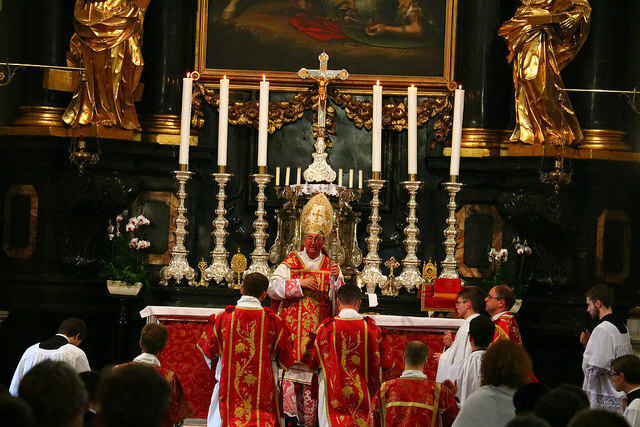 It was even more so during the Pontifical Masses that took place in the Church of Conversion of St. Paul, Krakow. Enraptured in the beauty of the Mass of All Ages with all its decorum and reverence, I could only hide myself under my veil awe-struck and captivated by the Love our Blessed Lord was offering for us on the altar. Jerome, from Singapore: The liturgy of the universal Church connected, presented and brought to life Salvation History and man’s history, (which WYD Krakow 2016 is part of). Did you find it a good experience? Dan: Yes, very good. I enjoyed being with the group and the people I met from all over the world and will definitely be keeping in touch with each of them. The whole thing was well organised, and had a good balance between planned and spontaneous arrangements. It was also good to be among people who had come together with a shared motive or interest. Issac: Yes. Because of the quality of the catecheses and the frequency of the celebrations of Pontifical Masses, Missa Cantata, Private Masses, etc. 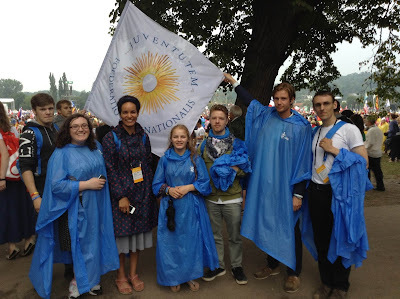 Ríona: I really enjoyed experiencing the contrast between the vibrant festival atmosphere on the streets and the beautiful peace of the Extraordinary Form liturgy; this combined with the frequent thunderstorms, made for an intense, exciting experience! Simon: A pontifical high mass almost every day for a week is a buffet of grace one cannot even wish for. How grateful we should be for this! 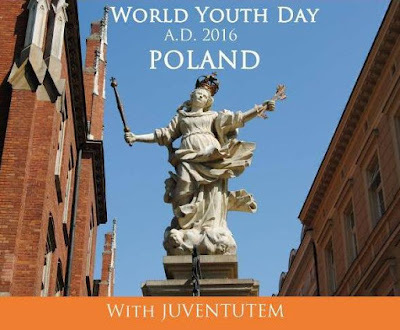 Janice: It was my first experience at WYD and I couldn’t have made a better choice than to join Juventutem. The biggest impression that I carried home with me to Malaysia is of the many witnesses of our Catholic Faith. 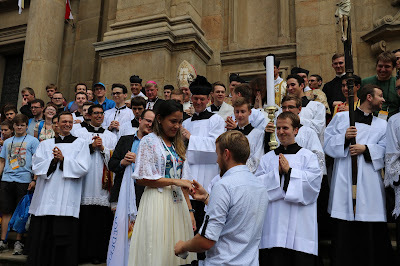 Besides Fr Michal, I met new friends who gave up an existing romantic relationship to join the seminary, friends who are considering religious vocation and also friends who desired greatly and went out of their way to assist at Holy Mass as altar servers – and suddenly, I don’t feel as alone in this journey of Faith. Jerome: Yes it was good. 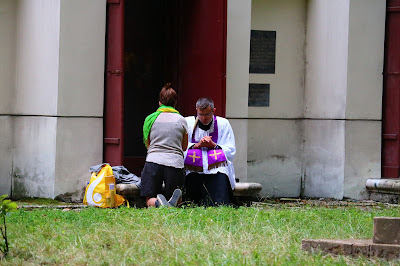 In the Asian Church, especially coming from South-East Asia, there is presently no clergy of the episcopate that celebrates the ancient form of the Roman-rite liturgy. 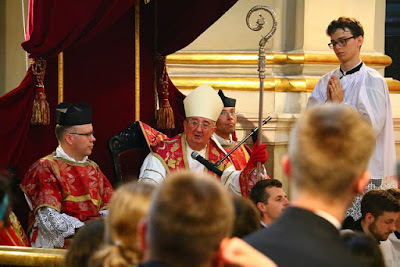 So participating in the various kinds of the EF liturgy, in particular the Pontifical High Masses is a dream come true and experience-of-a-lifetime! Dan: Hard to say, but several things: the group bond by the end of the week; the time to pray; the solid talks from priests and bishops; the fact that many people came for a Mass or talk who weren't part of Juventutem but just wanted to experience it, even for the first time, was good to see; I thought it was good that no one wasted time critiquing other aspects of WYD that were not exactly traditional (!) – everyone in the group were happy to be there, and to participate in the other WYD events as much as they wanted. Issac: The venues and their proximity with each other. The presence of 'good' prelates. Ríona: The catechesis was a great opportunity to be informed in living the day-to-day life as a Catholic. Simon: The best experience from this week will be the last (and only) low mass I heard at a side altar on the final Sunday. This thanks to its beautiful intimacy with the sacred sacrifice of our Lord. I found the trip a very good experience as well as a help to deepen my faith and the understanding for the will of the Lord in my life. Mathieu: The Masses of course, and the catecheses of our three excellent bishops. Dan: I guess all the queuing, but that is part and parcel of a WYD so nothing major or unreasonable. Issac: The choir could have been better organised and perhaps a bigger church so that people of different language groups can mix. Ríona: What I liked the least was the time spent in queues for food! Simon: The thing I liked the least was to see the crowd being so stressed and bumpy. How the eagerness of each individual to, get food, see the Holy Father, or another thing was placed above proper behaviour in public. Even though this was the thing I liked the least, I'm aware of the fact that this situation might have been much worse if there would have been more alcohol or drugs in the picture. Things still got on sufficiently well, without major catastrophes. 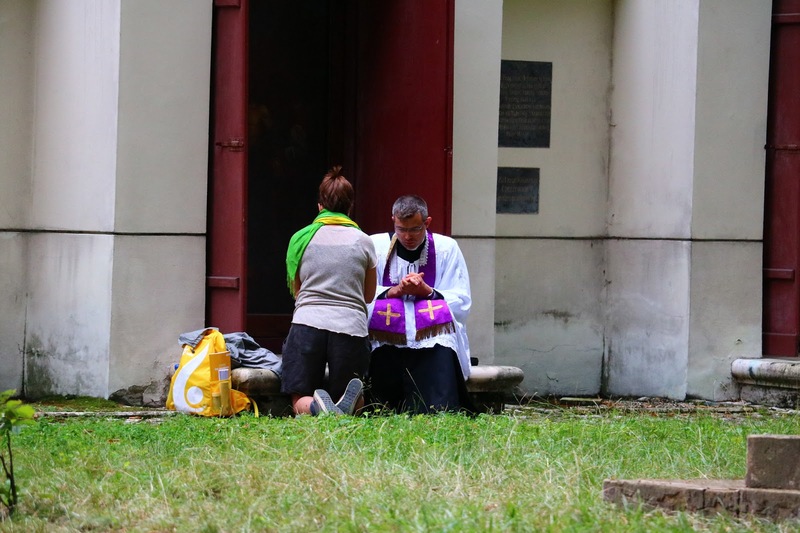 Mathieu: The digressions after the papal Vigil, and before the Sunday Mass. Dan: I think it has to be the marriage proposal on Friday after Mass, in front of a large group of people! Very nice indeed. Our chaplain having a forthright and kind chat with a young Jehovah Witness girl while two evangelicals stood next to him trying to give he some of the literature was a sight! 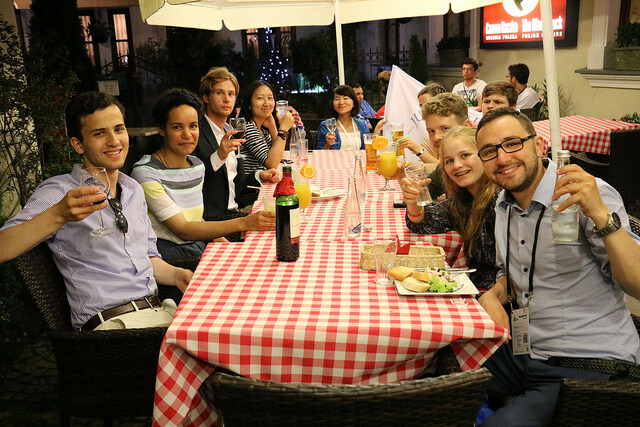 I also thought it was nice that our group were all people at their first WYD, and had just met, but made the effort to have conversations, arrange meals together. Seeing the smiles on the girls’ faces when I suggested going to a cake shop! I ended up eating herring two days in a row, despite my best efforts to try different things. Feeling proud that lots of the group (not me though!) did the long trek to the vigil and back, and some even camped overnight – well done them! Also, I was edified by the commitment to personal prayer shown by several of the group. They didn’t mean to, of course, but I noticed, and it had a good effect on me. 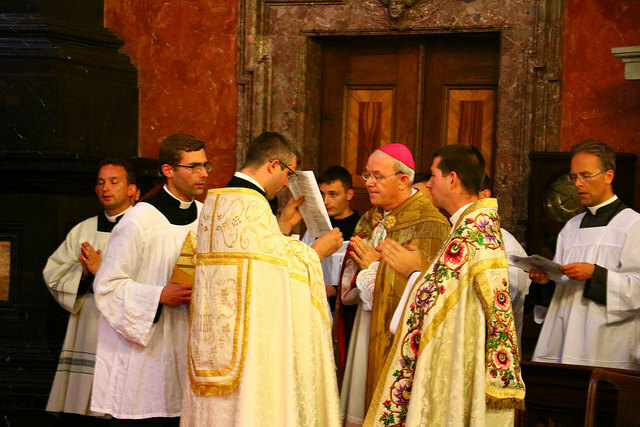 Issac: A chat with Bishop Schneider, when he said that the beauty of the liturgy is what makes it attractive to the youth. I think these words need to be taken seriously as a yardstick by which we establish the higher standard that is expected from international meetings like these. They must exceed what we are used to having in the majority of places. Simon: An anecdote to share is when a smaller group of us were searching for a place to pray our rosary an afternoon. We went from church to church without finding a place before we ended at the market square ready to give up. We made the queue to get in to the basilica of the Assumption of the Blessed Virgin where we were supposed to pray in silence, individually. After taking a small tour in the church one of us found an empty chapel dedicated to St Anthony. We borrowed it to say our rosary and foreigners joined as the decades went on. We ended by praying for the conversion of each of our home countries as well as for the papal intentions in order to get the indulgence, finishing by thanking St Anthony for helping us to find this place for prayer. What about someone you met: staff, pilgrim, clergy? Ríona: I laughed a lot and enjoyed talking with all the people I met in the Juventutem group. Dan: It was great to have a mix of priests and seminarians, made for good conversation and jokes over breakfast, lunch, and dinner. It was nice to chat to some of the WYD volunteers from Canada and Germany about their motives for giving up their time, and what they thought about experiencing the traditional Mass and good catechesis. 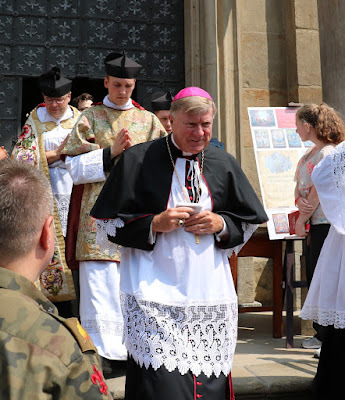 Simon: I will also carry the catechesis of the most reverend Bishop Schneider as well as those of the reverend Father de Malleray in my mind for a long time. 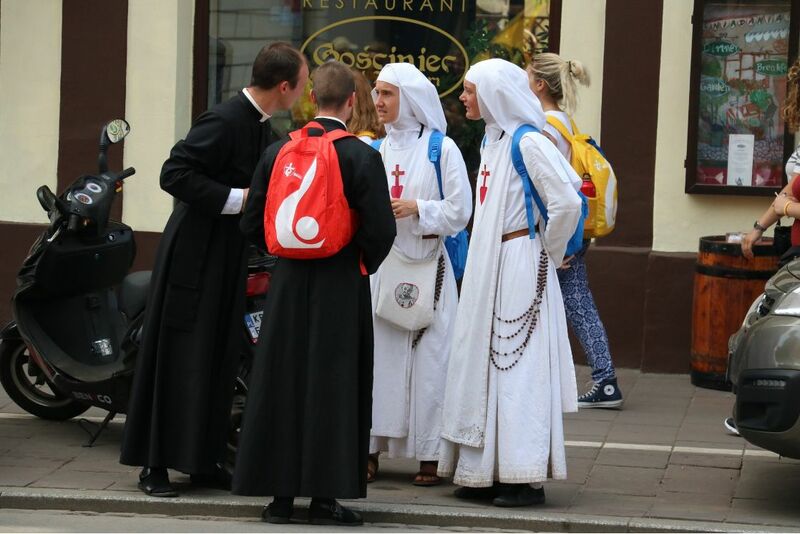 Thanks be to all concerned in making this week in Cracow possible! Aldo, from Italy, added: Meeting traditional Catholics from all around the globe it’s been amazing: and when it was time for praying the rosary together...well, no complications with foreign languages, because Latin helped us and made us feel united. Also the words of Msgr. Schneider have proven to be illuminating: out there the world is struggling with denial of God, but Our Lady guides us and at some point will triumph. For a youth international meeting, this is a great hope to rely on. Mathieu: We travelled by car with the Choir, calling twice en route for musical performances: once in Prague on our way there, and another time in Leipzig on the way back. 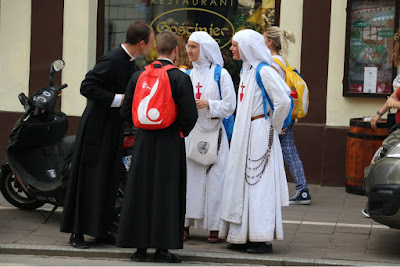 On Saturday midday in Krakow, we decided to park near Campus Misericordiae. But despite various attempts, we found ourselves surrounded by the crowd. A Polish family rescued us and we were able to park our car. They offered us drinks and coffee. The hospitality of the Poles was splendid. They even awaited us on Sunday afternoon to welcome us! Janice: Starting the journey during the Days in Diocese in Lgin, Fr Michal Graczyk who was in charge of our group did not only show such ardent charity to everyone around him, but even more, the 28-year-old priest in his black cassock, just by his life was already the perfect exemplar of a witness of Christ to us all by the dedication of his life to the priesthood at such a young age. He certainly left an imprint on many of our hearts – for me particularly, that one can have such courage to leave everything behind and follow Christ even as a teenager then. The group that we had in the Days in Diocese also saw us who came from the different parts of the world forming unique friendship. The one thing that we had in common – our love for the Traditional Latin Mass, was enough to knit us all together as a ‘wspólnota’ (which means ‘community’ in Polish). Jerome: I set off for Poland, the land rich in history of a nation, people and its (Catholic) faith. Thinking I knew much, I realised how little I did. I came back filled and receiving more than I could have ever asked or expected. The people, places and soul of the Polish nation is forever etched in my heart. Truly God is Merciful, Błogosławieni Miłosierni and Misericordes sicut Pater! And here are a few more photos from the same report.